Well, you could own more than 2100 average homes in Sydney. If cars are more your thing, you could buy 1800 Lamborghini Huracan Spyders and still have cash leftover for fuel. Or perhaps you’re into travel, in that case – you could fly first class return to London with Qantas more than 120,000 times. 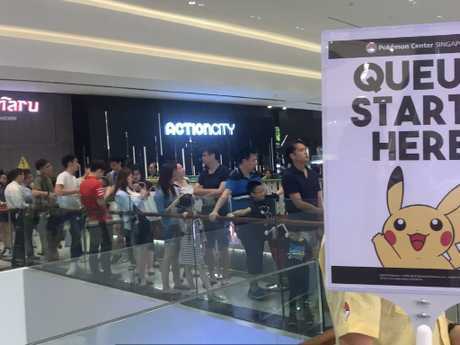 But it can also buy you the world’s biggest indoor waterfall, a Pokemon centre, your very own hot chip cafe called “Potato Corner” and a 130-room hotel – all under the one roof. 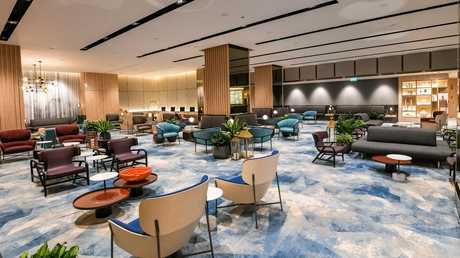 On Thursday, Singapore opened the doors to Jewel – a development five years in the making to their already outrageously big airport. 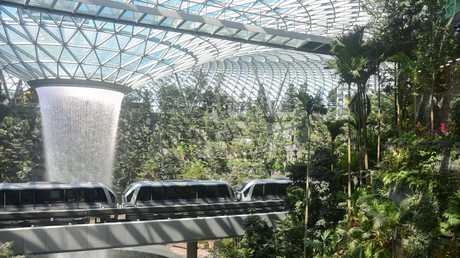 Stretching 10 storeys high – with four of those being a lush rainforest – the complex spans over 137,000 square metres to connect terminals one, two and three to a central hub. The astronomical extension, which has been built over an existing carpark, is like another world and a destination for tourists in itself. It’s almost like stepping in to a scene of Jurassic Park. 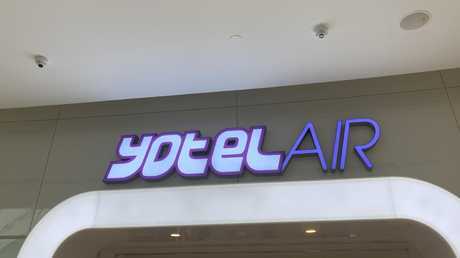 It’s turning the “get in, get out” concept of airport travel on its head and a game changer only Singapore could pull off. 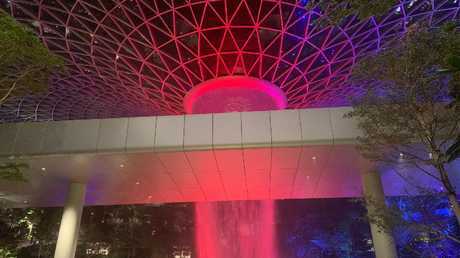 “Jewel will be a place where Singapore and the world meet,” Mr Lee Seow Hiang, chief executive officer of the Changi Airport Group, said. 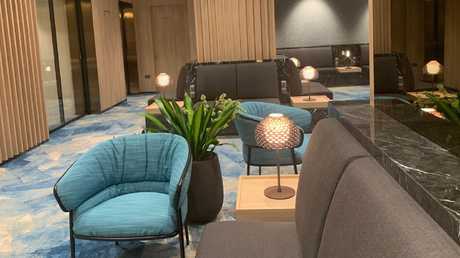 The airport is set to be an attraction, revolutionising the way passengers’ go about the “traditional” layover before getting on another flight. But unlike airports around the world, the vision for Jewel isn’t just for tourists – it’s designed with the locals in mind. There’s an IMAX movie theatre, more than 200 restaurants, bars and retail outlets all within a 20-minute train ride from the city. 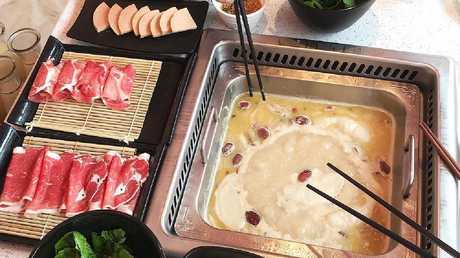 And unlike Sydney airport, or any other airport around the world for that matter, the Jewel hopes to target students looking for a place to study, a family wanting to grab a bite to eat or a couple going on a first date. 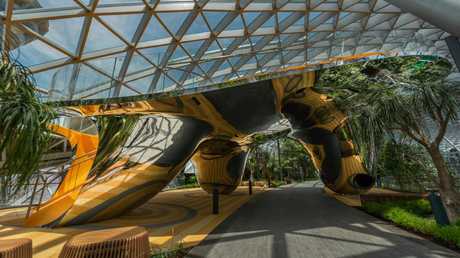 The new complex resembles a giant dome filled with the greenery synonymous with Singapore’s reputation as the “City in the Garden”. The facade is supported by a ring of 14 treelike columns and specialised glass material to create light while reducing heat. 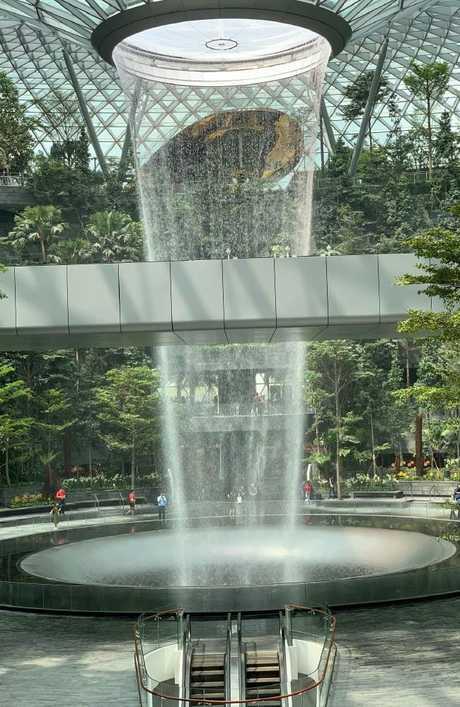 The intricate design means the gardens within Jewel are able to continuously grow, while passengers are kept cool and out of the humidity. 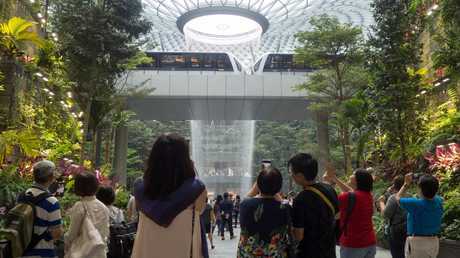 As a connection between terminals 1, 2 and 3, perhaps the most eye-catching structure within the dome is the 40-metre “rain vortex” showering down from the roof above. 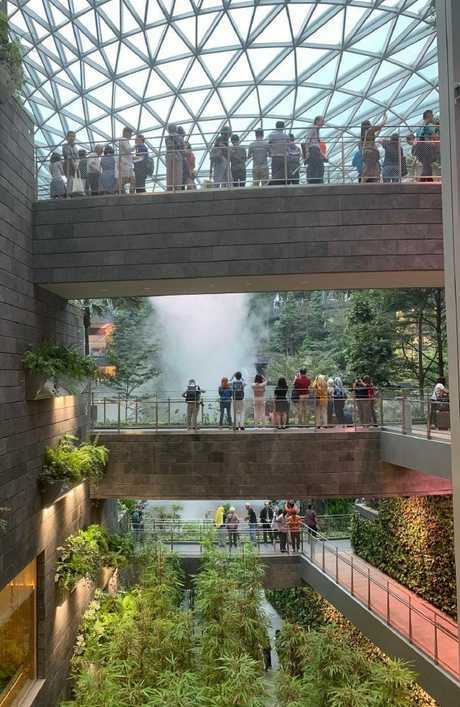 It’s the world’s tallest indoor waterfall and has been created with social media in mind. 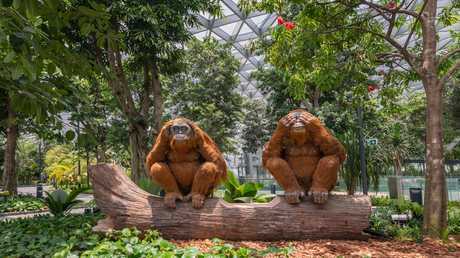 For the seventh year running, Changi has been crowned as the best of the best in the Skytrax World Airport Awards. And if you’ve stepped off a plane and into one of the terminals previously, it’s easy to see why. So with the consistent accolades, why the need for Jewel? “The unique proposition of world-class shopping and dining, seamlessly integrated with lush greenery, fulfils the needs of increasingly discerning travellers for a meaningful and experiential journey, even for brief layovers,” Jean Hung, CEO of Jewel said. So with more than 137,000 square metres to explore – here’s five reasons you’ll want to spend a layover at Jewel. 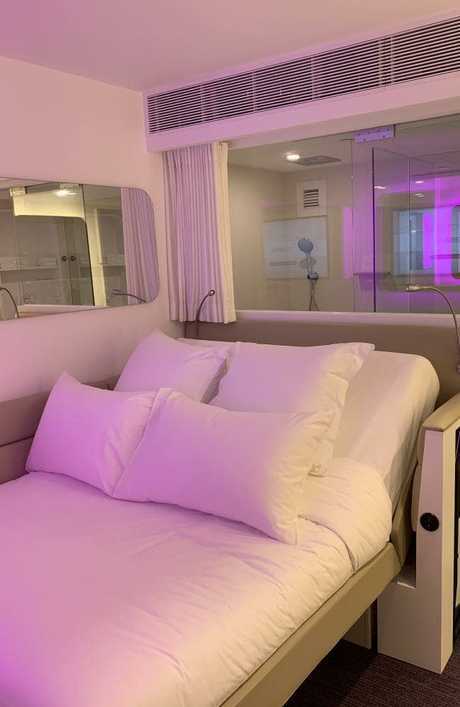 Don’t expect spacious suites and decked-out balconies because each cabin is just 10sq m in size, leaving enough room for a double bed, a fold-out desk and chair and a bathroom. 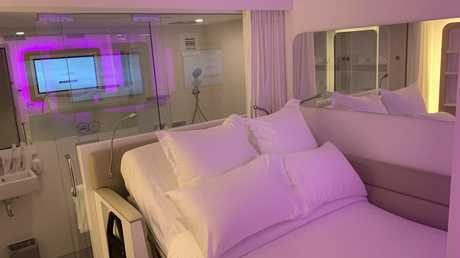 But for just $80 for two people, you can grab one for four hours or overnight for $160. If you’re travelling with kids, you’ll want to get in quick because there’s only four rooms that include a bunk bed and cater for families. 1. 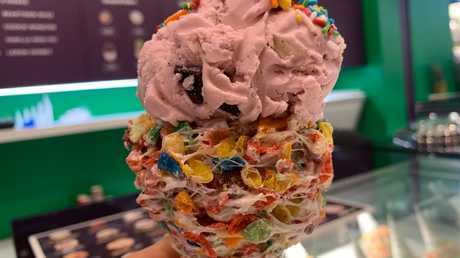 Emack & Bolio’s – if you’re a sweet tooth who doesn’t mind mixing your favourite childhood cereals with ice cream, this is a must do while at the Jewel. I went with the Fruit Loops-covered cone and Space Cake ice cream. For $11 for a single scoop and cone, it’s well worth the calories. Some of the other scoops of deliciousness include melted marshmallow, black raspberry and cake batter. 2. Shake Shack – OK, so not a local cuisine, but the burgers are quick and taste just like they’re straight off the grill in California. You’ll find it on Level 2 right next to one of the best views of the rain vortex in the whole dome. So take a selfie, and then grab a shake. 3. 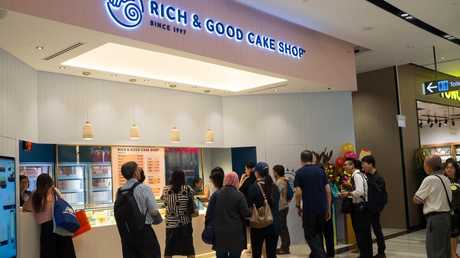 Rich & Good Cake Shop – Be prepared to wait in line, but as someone who isn’t a huge cake fan – it’s well worth it. These cakes are light and fluffy and filled with coconut cream. Soft and eggy, these Swiss rolls cut down to around 12 slices. As one of two stores in the world, expect to wait a while to grab yourself one. But for about $10, you won’t be disappointed. 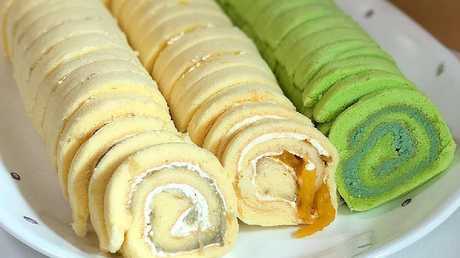 Try the D24 durian roll and mango Swiss roll, or the green tea Swiss roll filled with red beans. 4. Burger and Lobster – If you’re seeing a bit of a carb trend here, you’re not mistaken. Jewel has focused on catering not only for international palettes – but for what locals like to eat when travelling abroad. Burger and Lobster is popular among Singaporean travellers travelling to London especially, combining a love of good seafood and burgers under the one roof. The house favourite is the original lobster roll, but make sure you leave room for their oysters and claws. 5. Beauty in the Pot – This is for the health conscious traveller looking to have a good meal, with a few added benefits. Beauty in the Pot is exactly as the name suggests, offering soup-based meals coupled with beauty benefits. All the ingredients are made by chefs on site, and if you’re after a bit of help to wave off jet lag – give their iconic beauty collagen broth a go. 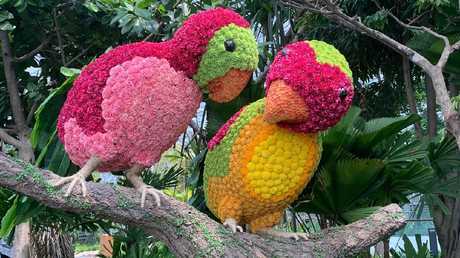 One of the key concepts of Jewel is to ensure the reputation of being a City in the Garden is maintained right up to when a tourist departs. Walking around the 137,000sq m dome, it’s hard not to stop and snap away – especially when you first see the rain vortex. The plants span up the walls, with 120 species from Australia, China, Malaysia, Spain, Thailand and the USA. At 40 metres tall, it’s mesmerising and uses the rainfall from outside to power the constant stream. There’s an early check-in suite within Jewel, meaning you can dump your bags at least 12 hours earlier with some carriers before boarding. The headache of lugging your bags around a city ahead of a flight has also been accounted for, with an early check-in service inside Jewel that Qantas, Emirates, Singapore Airlines and Scoot all use for passengers. 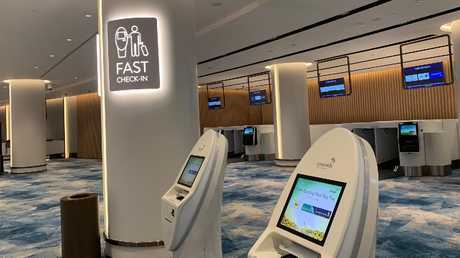 Basically, the service allows passengers to check-in to their flight, bag drop and be free to explore the airport up to 24 hours in advance for some carriers. Qantas, for example, allows passengers to check in 12 hours in advance within Jewel – while Scoot is open 18 hours before a scheduled flight. A trip to Jewel isn’t complete without swinging by the utter madness that is the Pokemon Centre on Level 4. 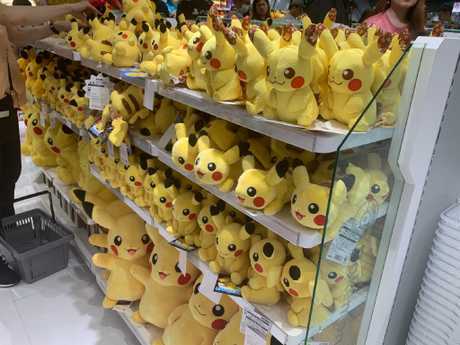 A friendly warning – don’t get between a 10-year-old and a stuffed Pikachu when venturing into this store. Inside the Pokemon Centre — don’t get between a kid and a Pikachu. Thankfully, if you’re not inclined to stepping into a shop filled with colourful merchandise, life-size characters and overexcited kids, there’s a pizza shop serving alcohol just six steps from the centre’s entry.